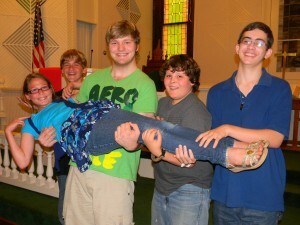 Nacogdoches – The City of Nacogdoches Main Street Program is gearing up for its annual Music to Lunch by Series. 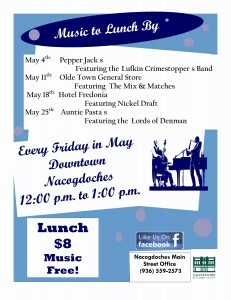 Music to Lunch By is a free event that takes place every Friday in May, from noon to 1 p.m., on the square in beautiful historic downtown Nacogdoches. 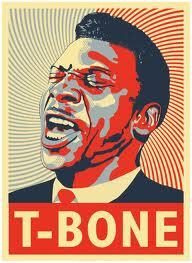 Mark your lunch hour calendars for Friday May 4th, May 11th, May 18th and May 25th. “We invite everyone to come out and enjoy their lunch hour on the red brick streets while listening to live music, it’s a great getaway from the traditional hustle and bustle of your lunch break,” said Main Street Manager Sarah O’Brien. Music to Lunch By is a free event; however patrons are encouraged to purchase lunch from one of our great downtown eateries that will be catering each Friday. Brown Bag lunches are available for $8.00. “Special thanks to our restaurateurs for participating in this great community event again this year,” said O’Brien. Seating is provided as well. Families, Groups, Organizations, and individuals are encouraged to attend. If you or anyone you know have any questions about the upcoming Music to Lunch By Series please contact the City of Nacogdoches Main Street Office at 936-559-2573 or obriens@ci.nacogdoches.tx.us . 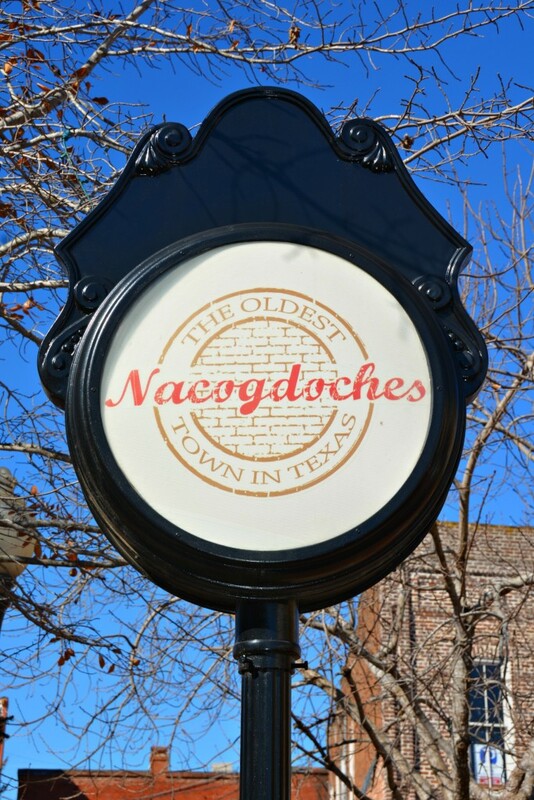 Nacogdoches, Texas- Nacogdoches has been commended for successful annual progress as a designated Main Street community. The Texas Historical Commission’s (THC) Texas Main Street Program (TMSP) made the announcement Feb. 11, 2015, at the winter gathering of Texas Main Street managers in Nacogdoches, Texas. JEFFERSON – Jefferson’s Sanctuary Players Theater Company presents Every Seventeen Minutes the Crowd Goes Crazy!, Pulitzer Prize winning playwright Paul Zindel’s landmark play addressing the subject of parental abandonment and the pressures young people face living in a fast paced, confusing and unforgiving world.